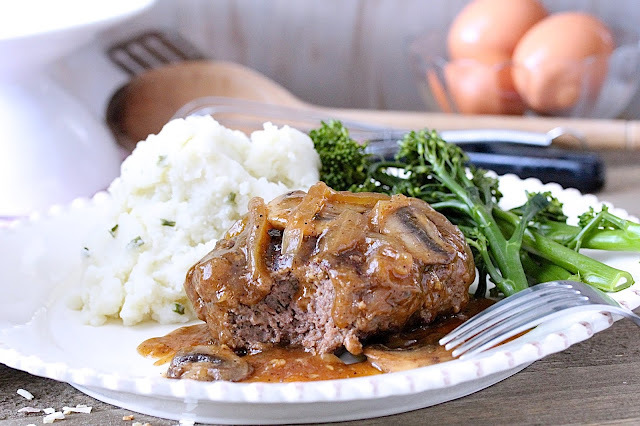 Make delicious, easy, and budget-friendly Beer-Braised Salisbury Steak a regular on the dinner menu. It's a meal that scores high on comfort and satisfaction at my house. My family is always happy when Salisbury Steak hits the dinner table. 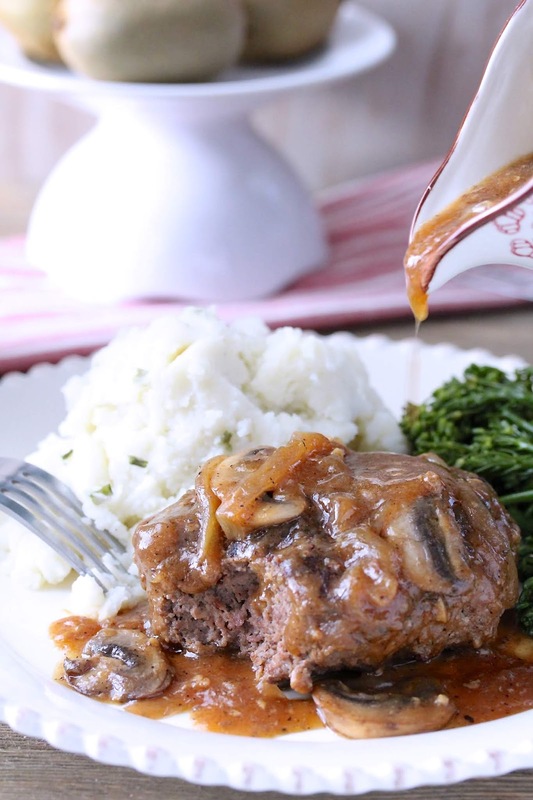 Beef patties braised in a beer-infused mushroom and onion brown gravy until tender is pure comfort food. And because this meal is easy to put together and affordable, I like making it for my gang! It all starts with seasoned beef patties that are skillet cooked until a nice coat of brown caramelization develops. They are then braised until tender. And I think this is where the star of the show comes in—the gravy! A touch of molasses provides sweetness, depth of flavor, and color. A little bit of ketchup adds a slight tang and sweetness. Finally, beer added to beef broth gives it that special somethin' somethin'. I like to use Honey Brown, a medium bodied lager (I am not being compensated for the shout out). It is my go-to beer for cooking. Worried about using beer? 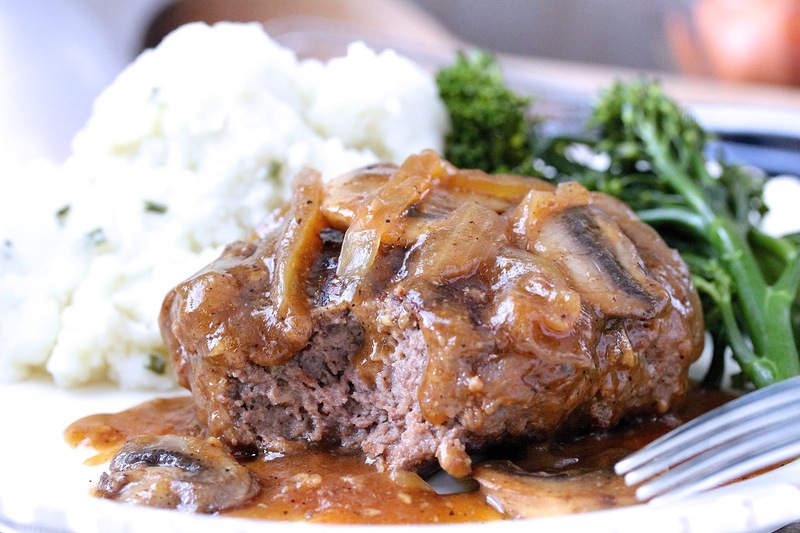 The heat cooks the alcohol out, but feel free to omit if you want a virgin Salisbury Steak. Just use all beef broth. I guarantee the gravy will still delicious!! Instead of plain mash, how about sour cream and chive mashed potatoes? It is total YUM!! My son calls a mouthful of Salisbury steak, brown gravy, and sour cream and chive mashed potatoes a flavor blast. I completely agree! Polenta is also a perfect side. Not only does it resemble mashed potatoes, its creaminess makes it an ideal substitute. Rice, in my opinion, can be eaten with everything. Pair it with Salisbury Steak and you won't be disappointed! Combine all of the burger ingredients. Divide into quarters. Shape each into a 3/4" thick oval. Whisk 1/2 cup beef broth and cornstarch in a small bowl until there are no lumps. Set aside. Add oil to a large preheated skillet on medium to medium high heat. Add beef patties. Cook 3 minutes on each side until the outside is crusty and brown. Transfer to a platter. If there is not enough room in the skillet, cook patties in batches. Using the same skillet, on medium heat, add onion, mushrooms, and garlic. Add salt and pepper. Cook, covered, stirring frequently for 6 minutes or until the onion is translucent and the mushroom is tender. Ad 1/2 can beer (the remaining 1/2 will be unused), molasses, and ketchup. Whisk ketchup smooth. Allow beer to come to a boil. Add beef broth and return the patties to the skillet. Bring to a boil. Cover and simmer on medium low for 15 minutes. Whisk the cornstarch slurry again. Add 3/4 of it to the gravy. Bring heat up to medium high, stirring frequently until gravy bubbles and thickens. If too thin after bubbling for a minute, add the remaining slurry. Adjust seasoning to taste. Remove from heat. Great served with mashed potatoes, rice, or polenta. These Salibury steaks would make my husband very happy! Perfect for the start of the autumn. Yay! I'm glad to hear that this is husband approved! My husband teases me about trying to kill him with mushrooms (he hates them with a passion) but he loves everything else about this dish! I love Salisbury Steak--beer could only make it better still! This was my favorite TV dinner when I was a child! Bet this is even better! I'm thrilled that it was your favorite dinner! I think you would also dig this version too!! I could too, Heather!! Or even with just rice! Thank you. The meat is tender and yummy!! why have i never made salisbury steak??? this sound so comforting and delicious Thao! This looks so soft and juicy! I feel like I'd want to eat this while watching TV, haha. Yum! !